Over the course of the last decade, as Europe’s energy market has diversified, solar energy has become a vital source of clean energy for many households. By the end of 2011, over 50 gigawatts of PV systems and 26 gigawatts (solar thermal energy) had been installed in Europe – enough to supply electricity to over 15 million households and provide domestic hot water to 12.5 million households with an average sized solar thermal system1. As demand for solar energy rises, SABIC and the VU University are collaborating to develop a new, more efficient solar thermal technology to harness sunlight to collect heat. 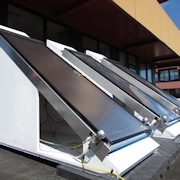 The energy from sunlight generates temperatures in solar energy collectors that often exceed the melting point of plastic materials, requiring the collectors to be constructed from expensive metals and glass that are heavy and restrictive in their design freedom. The concept developed and patented by VU University uses an “optical switch” by creating a prismatic structure of the thermoplastic panels made from SABIC’s Lexan* polycarbonate sheet in such a way that, the sunlight can be reflected before the panels get too hot. 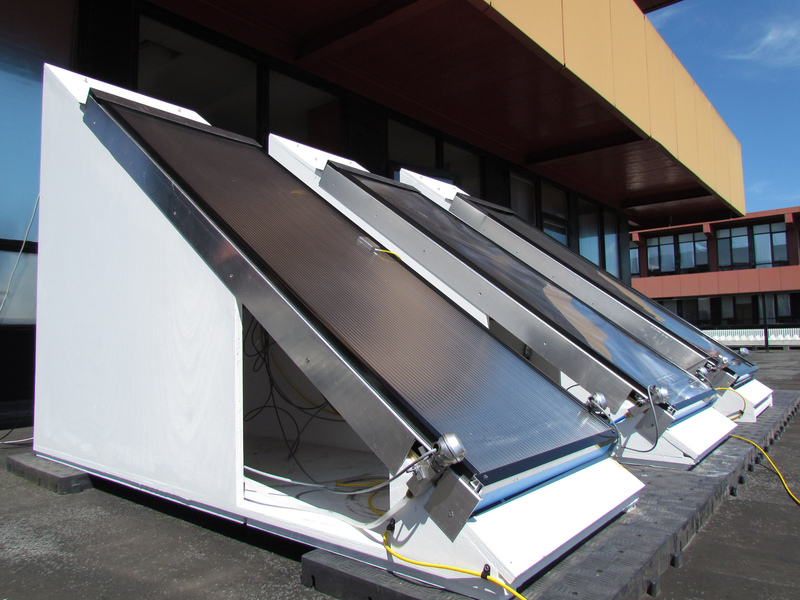 Professor Ronald Griessen and Martin Slaman of the department of physics at VU University have been looking for solutions to the problem of overheating in hot-water solar collectors and conceived the idea to limit the temperature by the use of geometric surface structures. In their search for an industrial partner, VU Technology Transfer Office came readily to the conclusion that SABIC, as a leading, global supplier of engineering thermoplastics with an 80-year history of breakthrough solutions, provided the ideal collaboration opportunity. Lexan* polycarbonate as base material for solar energy collectors can offer customers exceptional ease of use due to its lightweight and greater cost-efficiency by replacing metal to consolidate parts, reducing maintenance and simplifying installation. This technology can also be applied to greenhouses. The concept has already been awarded the EUREKA Climate prize by the province of North Holland in 2009 which contributed to funding further development together with The Institute for Fundamental Research on Matter (FOM). Download the image above in high resolution. Saudi Basic Industries Corporation (SABIC) ranks among the world’s top petrochemical companies. The company is among the world’s market leaders in the production of polyethylene, polypropylene and other advanced thermoplastics, glycols, methanol and fertilizers. SABIC recorded a net profit of SR 29.24 billion (US$ 7.80 billion) in 2011. Sales revenues for 2011 totaled SR 189.90 billion (US$ 50.64 billion). Total assets stood at SR 332.78 billion (US$ 88.74 billion) at the end of 2011. SABIC’s businesses are grouped into Chemicals, Polymers, Performance Chemicals, Fertilizers, Metals and Innovative Plastics. SABIC has significant research resources with 17 dedicated Technology & Innovation facilities in Saudi Arabia, the USA, the Netherlands, Spain, Japan, India and South Korea. The company operates in more than 40 countries across the world with more than 40,000 employees worldwide. VU University Amsterdam first opened its doors in 1880 to students. VU stands for ‘Vrije Universiteit’ which means ‘Free University’. Here, ‘free’ refers to freedom from state and church interference. Ever since it was founded in 1880, VU University Amsterdam has been known for its distinctive approach to knowledge. VU is an open organization, strongly linked to people and society. What matters is not just the acquisition of a greater depth of knowledge, but also a wider one. We ask and expect our students, researchers, PhD candidates and employees to look further – to look further than their own interests and their own field, and further than what is familiar and further than the here and now. Throughout the past century, the university has continued to expand. It now comprises twelve faculties and has teaching facilities for 26,000 students. The university campus and university hospital are situated in the south-western part of Amsterdam, one of the most dynamic and fast-growing business districts in the Netherlands. With more than fifty undergraduate (or Bachelor’s) programmes and almost a hundred postgraduate (or Master’s) programmes, VU University Amsterdam offers a wide choice of study options. The programmes are of a high quality, the atmosphere is very conducive to study, and the teaching staff is easily accessible. • As an acronym, SABIC should be all caps whenever it appears in print. • * Trademarks of SABIC Innovative Plastics IP B.V.
• 1 The European Solar Thermal Industry Federation (ESTIF) and the European Photovoltaic Industry Association (EPIA) press release at The European Solar Days event on May 11, 2012.